What a great year it's been in Green Class! Back in September, when a new set of children arrived to join us, with their new set of challenges, and personalities, the year ahead was clearly going to be a busy one! As always, we had challenging expectations for our pupils and looked forward to getting to know them. And as usual, it seems as though, through the year, they've taught us as much as we've taught them. Every single one of them has made great progress, and we are very proud of them. Thank you to all you parents and friends for the support you've given us, and for putting your trust in us to care for, nurture and develop the children you love so much, and who have become part of our family too. 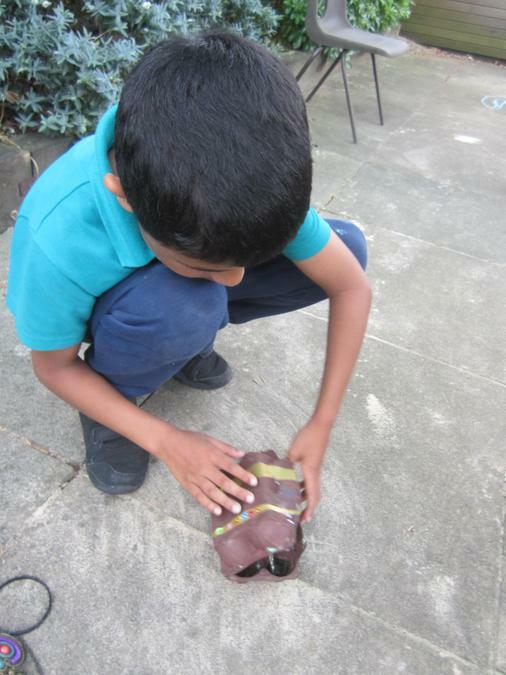 We leave you with some photos from our Vet's surgery role play and our pirate topic. Do be aware that you will still be able to access all the photos on this year's Green class page in the future (should you get nostalgic - I know I will!) , by accessing it through the archive link right at the bottom of the 'class pages' index. page. As many of you know, I will be retiring at the end of term, after 22 years at Richmond Hill! But I will still be popping in now and again, and following your children's progress with interest. Thanks again from me, Dil, Chandan and Elaine - and have a lovely summer. We are looking forward to an exciting and busy last half term of the year. 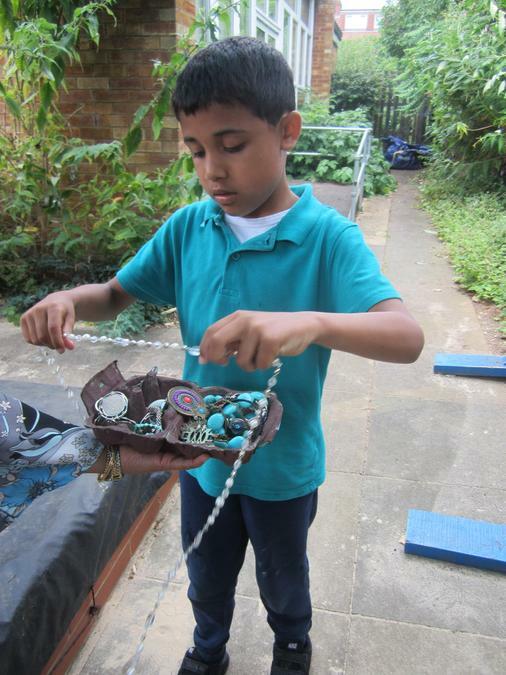 Our topic is Treasure Island, and we'll be doing lots of activities based on Pirates, treasure, sea and sand. We've already made our pirate hats! Our story for the first few weeks, is Shark in the Park. A couple of children know this book from past classes, but they seem very excited to come across it again. We are making our own telescopes like Timothy Pope's, and will be taking them to the park so that the children can look for sharks. Little do they know it yet, but they might well find an inflatable one in all sorts of strange places! 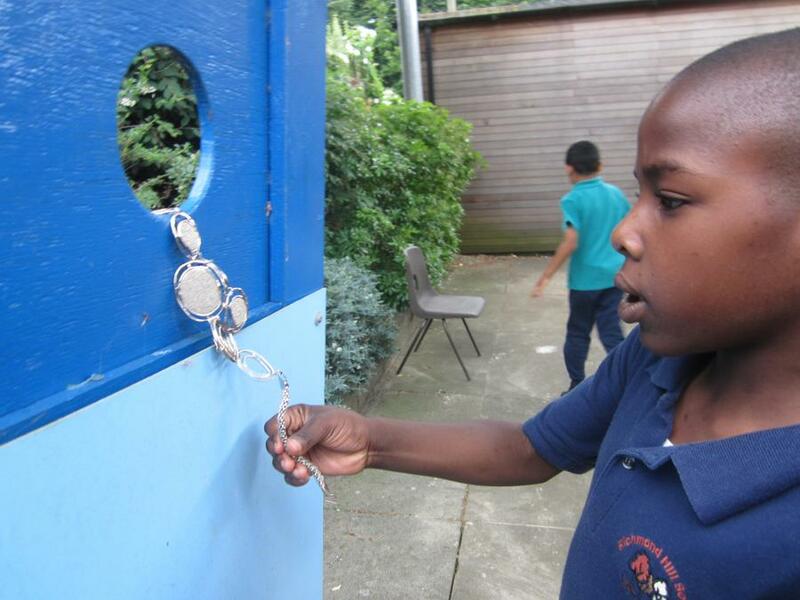 After making our egg box treasure chests, we went on a treasure hunt! 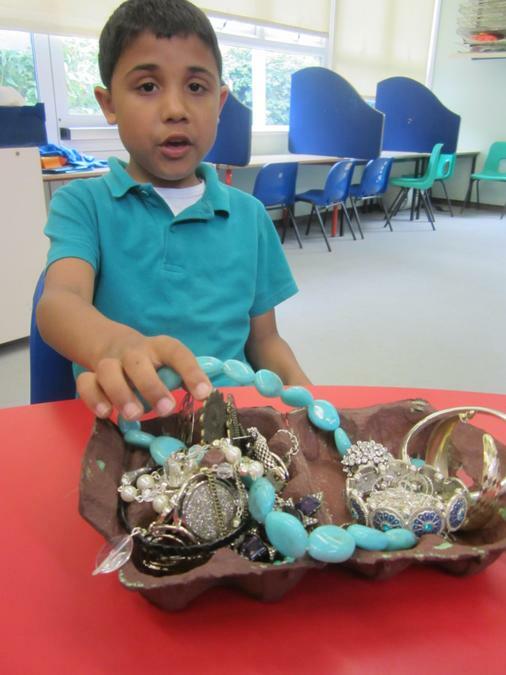 The children found all sorts of jewellery hidden in the area outside the classroom, and lots of rings and tiny jewels in our sand tray. 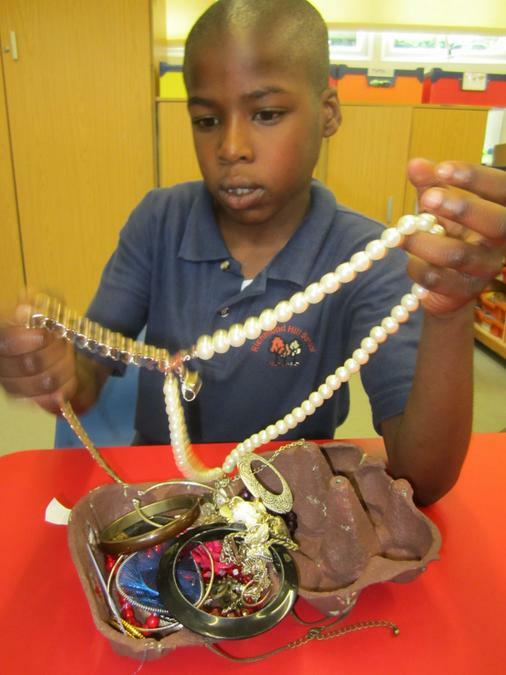 They really enjoyed filling up their treasure chests with their finds! I seem to have a couple of new assistants. The children have been taking a lot of notice when we put up displays in the classroom or corridor. While we were drawing and colouring some pirate related things the other day, two of them decided to complete our treasure island display themselves. We left them to it, and they put lots of thought into how they arranged things. They didn't need us at all! Summer 2- Shark in the Park! Today we went to Wardown Park with our home made telescopes, and just like Timothy Pope, we discovered that there was a shark in the park! He kept appearing in all sort of places! The children really loved the activity and behaved very well - even if a couple of the telescopes did get thrown into the pond! In Green class, we are very aware that it's easy to help our children TOO much. With that in mind, at least once a month, we give the children a task that we don't help them with at all. We sit with them to give them verbal encouragement, but we don't interfere. It's harder than you might think, to stand back and not give a helping hand! But we want the children to get that buzz of achievement. To be able to look at a finished product and know that they did it all by themselves. 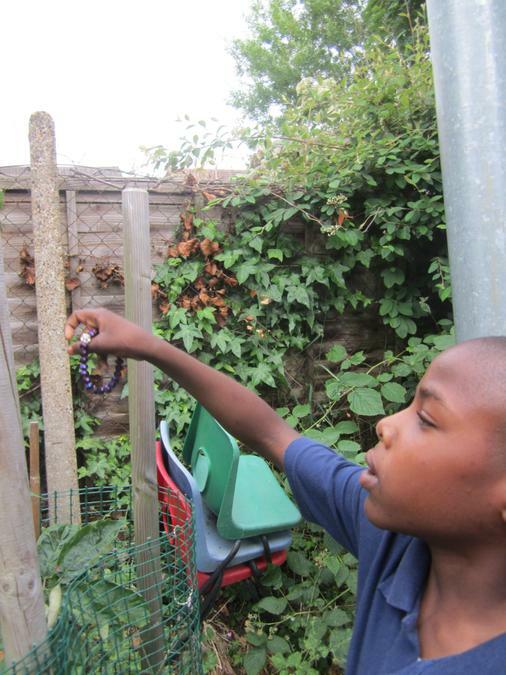 And importantly, sometimes a child will demonstrate that they can do something that we didn't realise they could do! Yesterday we looked at a picture of the fat, very hungry caterpillar. I showed the children the resources we were going to use, and we made an example as a group, so that they really understood what it was they were going to do. Then we provided them with the art materials and a blank piece of A3 card, and left them to it! We are really proud of what they did. They were so focused and so intent on the task - and SO proud when they had finished. I'm sure you'll be proud of them too. 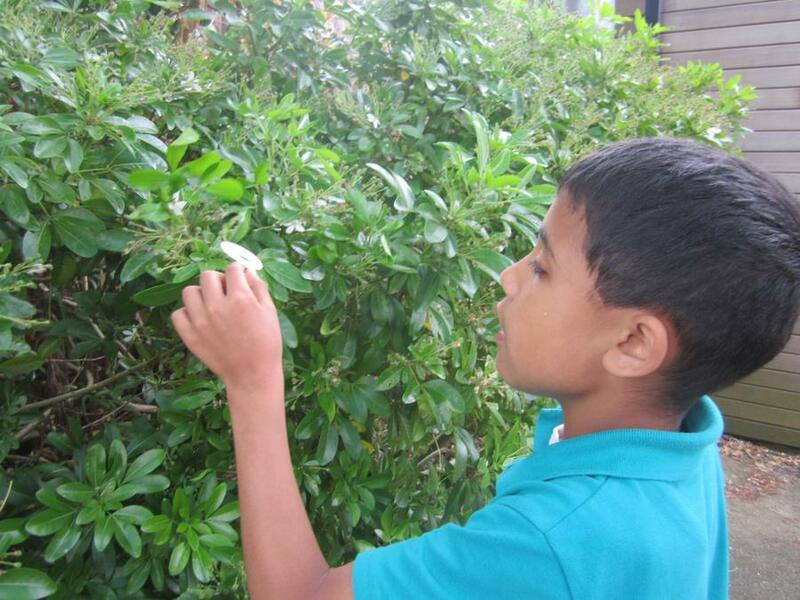 As a fine motor control activity, the children punched holes in laurel leaves (just like the hungry caterpillar). They then used their leaves for a threading activity. They really enjoyed using the single hole punchers! I hope you all had a great Easter break. The children have certainly come back with a spring in their step, and raring to go. This half term, our topic theme is The Very Hungry Caterpillar. The book itself is a popular one that some of the children are familiar with. It's colourful and enjoyable, and we are going to extend their interpretation of it by studying life cycles in science. We will have some class caterpillars and watch them develop into butterflies. Our other core subjects will also be built around the book. In maths we will look at the concept of time, and the days of the week, as well as making caterpillars of different lengths and talking about long and short. In PSHE we will look at the foods that the caterpillar eats in the story, and whether they are healthy or not. And of course, we have lots of lovely ideas for art and craft, around caterpillars and butterflies. As I write this, we are looking forward to our trip to Whipsnade Zoo, where we will visit the butterfly house. We're coming to the end of our royal topic, and the children have continued to enjoy the activities within it. 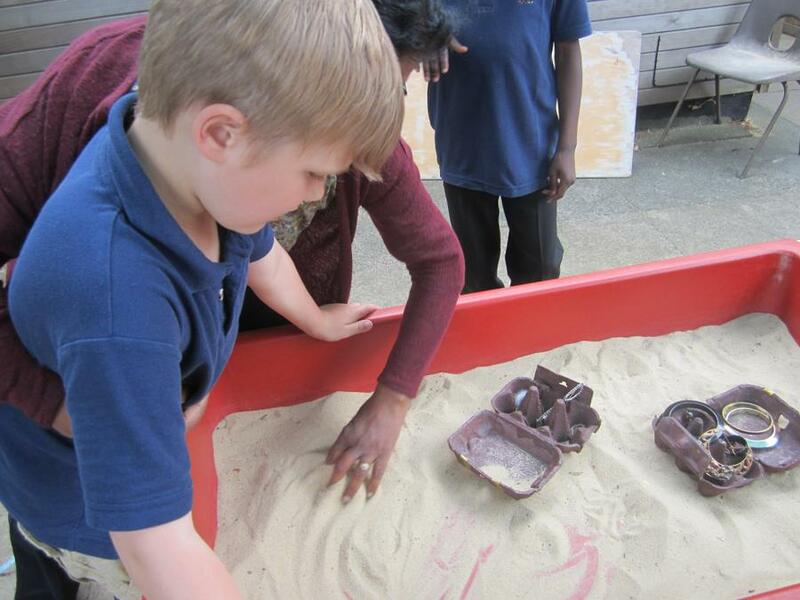 They've searched for jewels in the sand tray, made two different crowns, painted themselves as kings and queens, and used chalks to shade a photo of the Queen, as well as making crowns out of playdough. This really tested their fine motor skills, as they picked up and put in tiny beads (it was even harder for them to pick them out again!). It's been a fun half term, and we look forward to coming back after the Easter break to our new topic - 'The Very Hungry Caterpillar'. Stand by for lots of activities about life cycles and healthy eating! We are really enjoying our new topic for this half term. Our theme is 'Kings and Queens and all things Royal'. We started out by looking at castles. The children sponge painted some castle walls which we are using to make the doorway into our classroom look like a castle entrance! They've enjoyed playing in a pop-up castle tent, and most of all, they enjoyed a group session with a Construct a Castle set. We were really impressed with the way they used the component parts co-operatively, and clearly had a vision about what they wanted to create. I hope you enjoy the photos from this activity. We had a great time in our drama room, pretending to be Kings, Queens and knights. We had out pop up castles, lots of dressing up clothes, and very royal music and castle scenes in the background. Again, the amount of interaction between our children was a real pleasure to see. They played imaginatively, and co-operated together both verbally and non-verbally. We adults were able to just stand back and enjoy (and of course, take photos for you). A lovely session. We were really excited to head for Jade room and add our two decorated boxes to the pile, to make our truck. 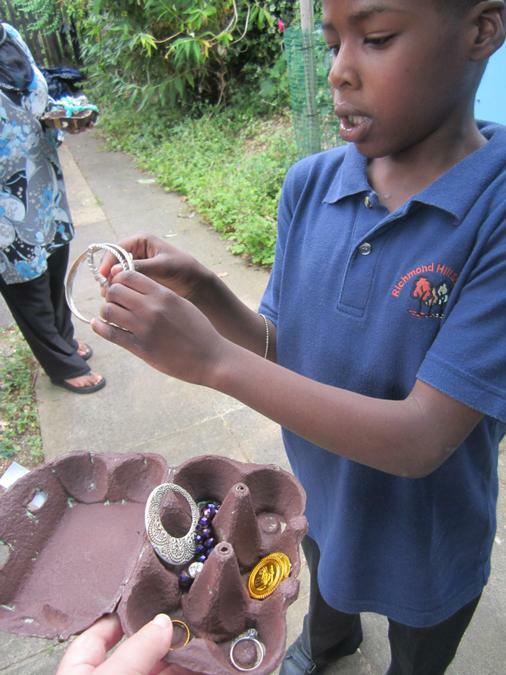 The children were really focused on exploring and arranging the boxes, and totally engaged in the project. When some of their friends from last year, who are now at our new East site, turned up to join in, it was a lovely surprise. It was so nice to see our children recognise them (and in some cases, their last year's teacher) and be so delighted to see them, greet them and play together again. In cookery, we made a classic Victoria sponge for the school bake-off competition. We thought ours was the best entry, even though we didn't win! 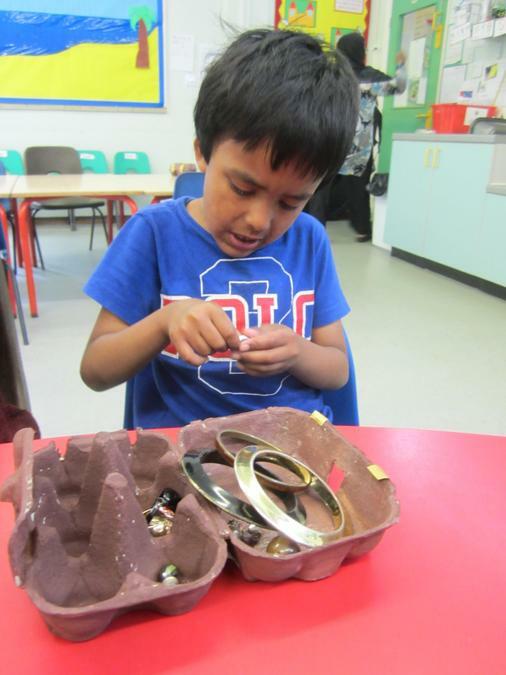 This week we will be making crowns in our topic sessions, and looking at knights and shields the following week. There will be lots of opportunities for the children to dress up and enjoy role play. Our story this week is Peace at Last, by Jill Murphy. We will be finding out about sounds in science this half term, so this book about Mr Bear not being able to get to sleep because of all the sounds around him, fits nicely into our curriculum, as well as being funny. It has a repeated phrase for the children to join in with - "Oh no", said Mr Bear, "I can't STAND this!" We've all really enjoyed our 'Come Dine With me' topic. The children have experienced and cooked dishes from Italy, India, China and the USA, as well as our favourite traditional English recipes. They particularly enjoyed using Jill's pasta machine to roll and cut their own tagliatelle, and whizzing up milkshakes with the hand blender. Some of the adults learned a thing or two about other cuisines as well. As we reach the half way point of the academic year, we've been able to look back to where we were in September. 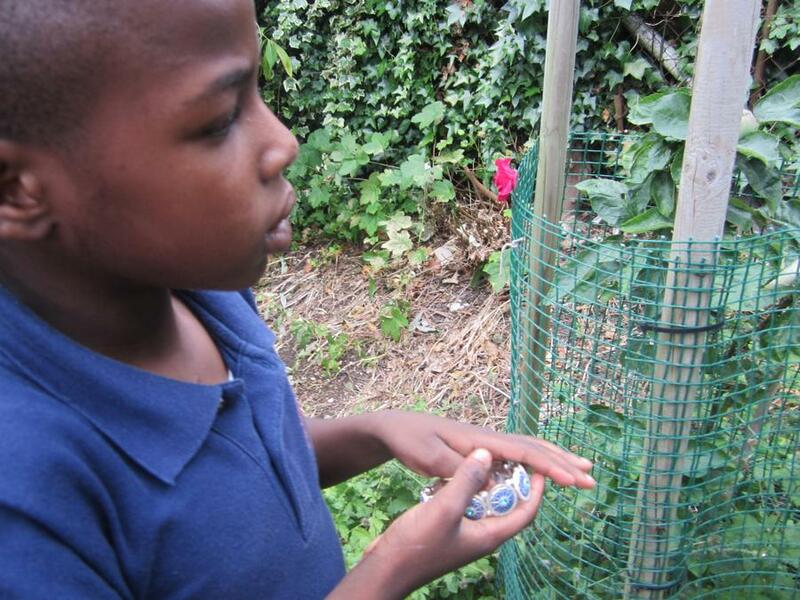 It's been rewarding to see just how much the children have progressed. Every single pupil has developed, particularly in communication, which is always a priority for us. It's lovely to hear previously quiet children wanting to share information or experiences with us, or being able to make their needs known more effectively. But the most rewarding thing of all is how much they interact now. They all really like each other, and want to engage and play together. This is such a huge thing, and it's lovely to see them co-operating in games that they've invented for themselves. Their verbal and non-verbal planning and interaction is fascinating to watch. They each have their roles, and the co-operation is amazing. It's been a very satisfying half term. Welcome back, and a Happy New Year to the Green class families and friends. Our topic for this half term is called 'Come Dine With Me'. We will be exploring cuisines from around the world, and finding out about cafes and restaurants. Our cookery will be based on food from England, China, Italy, India and the USA! At the end of the topic, our Rainbow room will be turned into a role play cafe. In science, we will be looking at different materials - how they feel and how they change with time. Se will be making some play food with salt dough and clay, as well as being especially aware of how our cookery ingredients change when they're cooked..
Our literacy story for the first couple of weeks, is called 'The Elephant and the Bad Baby'. The bad baby takes food from various shops and cafes, but his mummy invites all the owners for tea, and makes them pancakes! It's a lovely rhythmic story, and if your children start saying "rumpeta rumpeta rumpeta. ALL down the road", that will be where they heard it! " We started our writing week with some mark making in shaving foam. The children are practising anti-clockwise circles, to enable them to form the letters o, a, c, d, e, g, and q accurately. They have lots of fun at the same time! This week has been Chinese food week. The children made Peking Quorn wraps in cookery, and we explored the food that we might get from a Chinese takeaway. We had lots of fun with chopsticks! First the children practised using pom poms and pipe cleaners, then they tested their skills by picking up slices of banana. Finally, we graduated to trying to eat noodles with chopsticks! 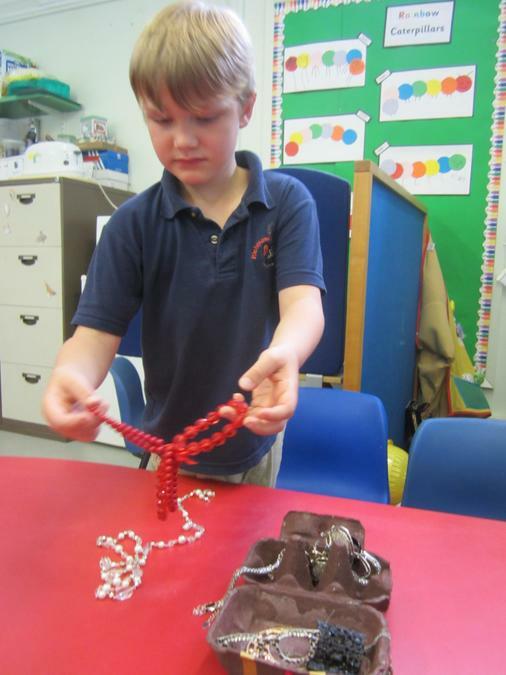 It was a lot of fun, and developed their fine motor skills along the way. 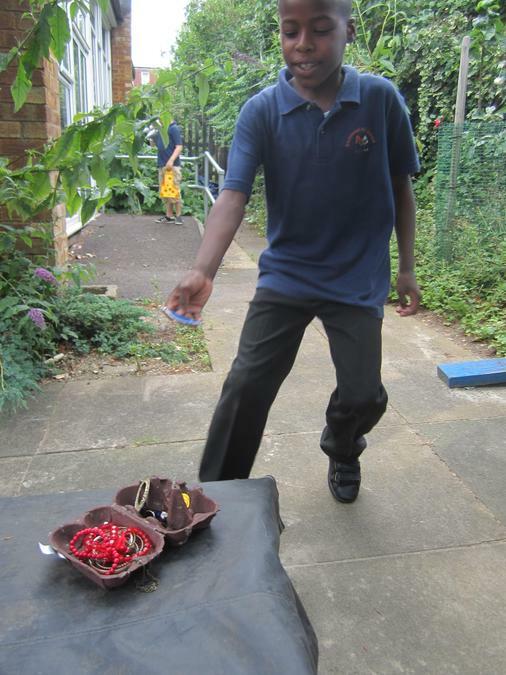 In DT, he children also made a plate of 'chow mein' using string for noodles, and felt and card for the vegetables. They really enjoyed arranging and sticking it all onto their paper plates. With the new half term, we have a new topic. It's called 'Over the Rainbow' and has a strong focus on colour. Each week we will be working and enjoying exciting and sensory activities about a single colour. 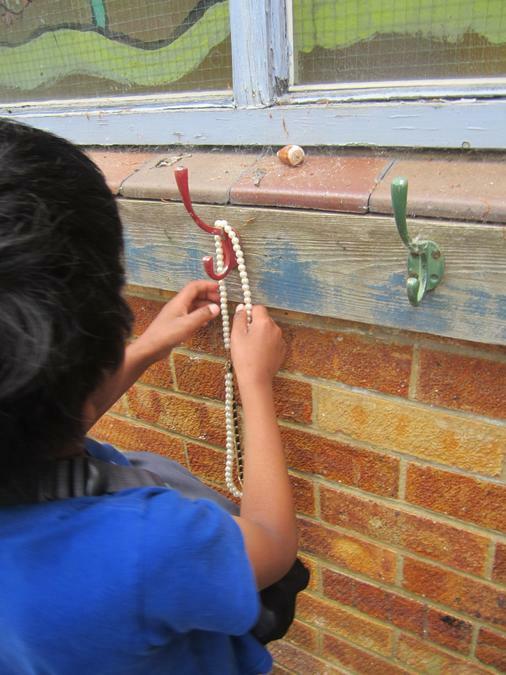 This week is Red week,and we have already been exploring the school and classroom environments to find things that are red. In science we will be finding out about colour mixing and looking at the world through different coloured lenses, and even our cookery will be based on the colour of the week. We will be matching and sorting colours, and mark making in lots of colours, as well as giving the children lots of colourful items to use for fine motor control fun. Our story for the next couple of weeks is Brown Bear Brown Bear, What do You See? It is another simple story with lots of repetition, and some lovely illustrations. The rhythm of the words makes it easy for the children to join in, and we have lots of lovely resources to involve the children They will also be painting or making collages of each of the animals. The children are really enjoying our Brown Bear story and our colour activities. We have made a beautiful display of collage animals from the story, and the children have been able to label each creature with the symbols for its colour and animal name. Yesterday we proudly shared our display picture of Brown Bear, Brown Bear on Twitter and we received 2 replies. The first one was from the Carle Museum, which is dedicated to the author Eric Carle (who wrote the story) and the other reply was from MacMillan Kids Books who are celebrating the story being 50 years old! You can see both replies below. They are also enjoying this colour monster song. For a monster theme, it's a very nice, calming tune. I recommend it for a bit of chill time at home, while reinforcing colour names! The children enjoyed making the monsters from our colour monster song. Handling playdough is really valuable activity, increasing the children's hand and finger control, and also having quite a calming and therapeutic effect. They rolled spheres and squashed them to make the body, then rolled thin 'sausages' for the arms and legs. Some of the children then became very focused about adding detail such as facial features, and all were able to identify the colours. It was a lovely session. We make lots of use of this big tray. Today, as part of our colour topic, we used rice coloured with yellow food colouring. 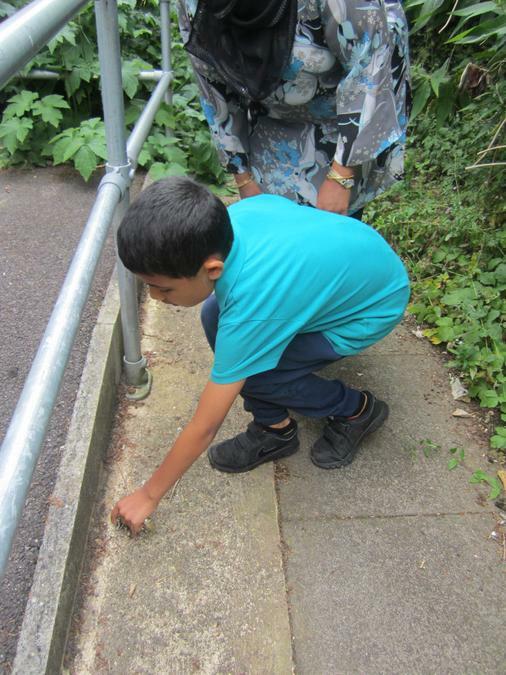 It was put in the tuff spot with lots of very small yellow items, which the children tried to remove with tweezers to improve their pincer grip and fine motor control. They also were able to play with the rice. On another occasion, we filled the tuff spot with a mixture of Duplo and Lego as part of our maths work on big and small. 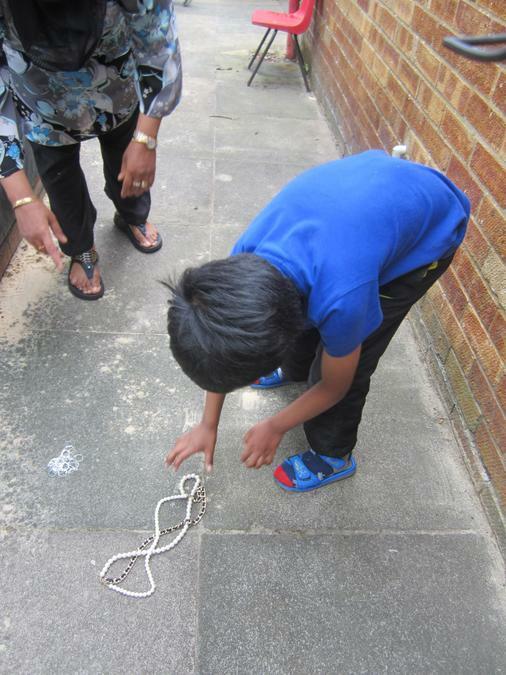 The children had to sort the bricks and build an item with either the big bricks or the small bricks. The tuff spot is a very simple but hugely useful resource in the classroom. It contains the messiest of sensory play items (like shaving foam or cornflour gloop!) and helps the children explore and make things in a contained area. With winter arriving, some parents have found that having one at home means their children can enjoy sensory play (or play with products that have loads of pieces!) without making a mess in the house. In case you're interested, It's possible to buy these at B&Q (their real purpose is for builders to mix cement in!) or from Amazon or eBay, where I believe it's possible to buy them in brighter colours. Welcome to the Green class page of our school website. My name is Sarah and I am the class teacher, assisted by Dil, Anita and Chandan, The children in Green class this year are Demi, Jaelan, Jasmine, Mustafa, Teddy, and Saniyah. The children have settled in brilliantly, and it's hard to believe that we are already coming to the end of the second week! I will update the page regularly with pictures of the children enjoying their learning, so do check the website regularly. Our topic this half term, is Champions. The children are finding out all about their bodies, how they work and how to use them and look after them. We have an extra PE slot with John so that we can take even more exercise, and we will be having a class champion every week. Our story at the moment is Little Rabbit Foo Foo. The children love this repetitive and rhythmic story about a bad rabbit and a good fairy, and they are already joining in with voices and sign. We say the words when we read the story,but here is a song version which we also enjoy. It's been a very busy and active few weeks, in Green Class. We now have a new story for our literacy lessons. It's called Mrs Wishy Washy, and although it's quite short, it gives us lots of opportunities to involve the children in signing and speaking the simple text, as well as lots of sensory fun! In maths we are working on shape again. The children have been focusing on circles in their environment, as well as matching and sorting shapes. The children are really enjoying our story about Mrs Wishy Washy. Today they made their toy animals roll, jump or paddle in the mud. They then put them into their tubs of soapy water and washed them clean... before muddying them up again!